AT A time when the world is pushing for organic farming, the US is advocating the no-till method. Tilling, a process that turns soil inside out, helps develop a good seed bed while destroying weeds, insects and microbes. Organic farming requires land to be tilled to control weeds and pests without using chemicals. For years, scientists and farmers have prescribed tilling as an agricultural method in absence of chemical fertilisers as it brings to top nutrient-rich soil. Some scientists now contest this technique. Tilling, they say, makes soil release carbon dioxide in the atmosphere which leads to climate change. When not tilled, soil retains its moisture content, preserves soil nutrient and erosion is at its minimal, they add. But no-till, also called conservative farming, has its own set of problems. A study conducted by a team of scientists at Penn State University and the University of New Hampshire reveals that no-till dramatically increases weed population. Published in the January-February, 2011, issue of Agronomy Journal, results of the study indicate that adopting no-till for organic production can pose a challenge for farmers in managing weeds. The results are troubling, says Richard Smith, assistant professor at the University of New Hampshire. “The species of weeds that increased included Canada thistle and bindweed which are perennial in nature. Once established, they are very difficult to control without tillage,” he adds. To destroy weeds during no-till, many farmers use herbicides. O P Rupela, former soil mirco-biologist at the International Crop Research Institute for Semi-Arid Tropics, thinks US is promoting no-till “because of vested interests of pesticide and herbicide companies under the garb of conservative agriculture”. Should India adopt no-till or not? Finding answer to this query is a big challenge for a country where poor-resource farmers try to make money even from crop residue. No-till does not leave even this for farmers. Remains of the harvested crop must be left on the surface to provide nutrients to the soil. P S Pangli, a progressive farmer in Punjab, says the wheat residue can fetch up to Rs 7,000 every 0.4 hectare in Punjab and Haryana. It is used as animal fodder. Rice straw is used by the cardboard industry and packers. Dinesh K Benbi, soil scientist at the Punjab Agricultural University, says the practice of removing residues from the soil exacerbates its compaction by lowering soil organic carbon. Many studies worldwide, he says, link carbon release with tilling. The concept of no-till has come from scientists working in temperate climate zones like the US where pests and weeds do not get destroyed even if land is tilled, says G V Ramanjaneyulu, scientist at the Centre for Sustainable Agriculture, Hyderabad. Universities in the West, as also some in India, encourage no-till where herbicides can be used to get rid of weeds. For India and South Asia, shifting from the traditional tilling system requires a miracle, says Rattan Lal, professor of soil science and director of Carbon Management and Sequestrian Centre at The Ohio State University, US. For farmers who have been tilling through generations the transition can be difficult. Lal, who supports no-till technique, suggests compensation money to farmers who adopt no-till. “This can be done through the Kyoto Treaty or by the World Bank’s bio-carbon fund. Besides, farmers can be brought into carbon credit trading by not selling crop residue and allowing cattle to graze on their land,” he says. Indian farmers, who till their land, do not find weed removal too difficult a task. 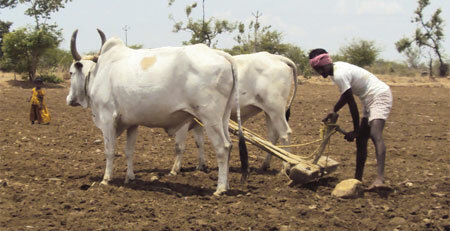 Eighty per cent of Indian farmers have small or marginal land holdings. If calculated, a family of four can remove weeds manually by putting in about 200 days on the field, says Rupela. He has studied tilled and no-tilled land and says little research has been done to indicate techniques suitable for specific agricultural areas. One must wisely choose between the two. Masanobu Fukuoka, a Japanese scientist turned farmer was the first to develop this technique. He planted rice by 'broadcasting seed into standing crops of other plants without tilling. He published his experiences in book called 'the one straw revolution'. Today there are many farmers in India who are practising this technique successfully. Notable amongst them are Mr Vasant Futane in Maharashtra and Mr Raju Titus of Hoshangabad Madhya Pradesh. They also have a yahoo group (fukuoka_farming) which has members world wide, regularly exchanging information and experience. This is bad news for pesticide and fertilizer companies. So long as we think the weeds are created without any purpose and that they have no right to live on this planet , we will be at war with them . But once you know how to control them by cutting instead of uprooting them , farming will be easy to practice. And the cut weeds serve as good mulch . No-tilling is relatively easy job in horticulture crops and many are successfull in this. Now a days many are re-inventing no-till because of high labor charges. Applying no-till in vegetables and grains is still a challenge. Fukuoka san has successfully demonstrated this, but this is after years of research and duplicating it in different area also involves lot of experiments. Also for grains this involves proper rotation of crops which many farmers does not do now a days. No-till in grain also require great perfection in crop timings also. But this certainly increases the fertility and water holding capacity of land and is environmen friendly. So if there is enough research is done in different parts of the world, no-till for grains also can be made successful. No-till promoted by herbicides companies and they are just into business, so let us not listen to them at all.